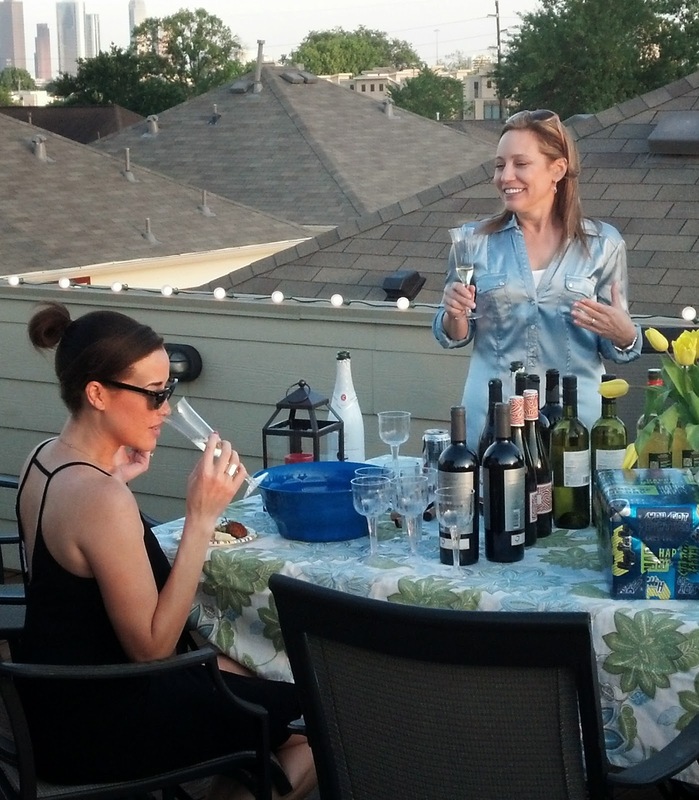 I was asked to speak about Spanish wine and to conduct a tasting at the 30th birthday party of Kyla Kennedy on the rooftop patio of her and her fiancé, Jonathan Garrett's home this past Saturday. They invited a great group of friends with a new interest in wine tasting. Jonathan had the idea after the two had watched the movie "Somm" and had become interested in learning more about the wines of the world. Anna de Coderniu Brut Cava* - Guests loved this Spanish sparkler! They found the history of the winery interesting and enjoyed the refreshing style of the wine. The birthday girl named the subtle tropical and citrus aromas like a pro. 2012 Burgan's Rias Baixas Albarino - Guests talked about the fresh peach aromas and the crisp taste. Many felt this could be their summer sipper. 2012 Raimat Costers del Segre Albarino* - Guests were interested in learning about this lesser known area, the innovative winery and how the more extended time on the lees affected the texture of the wine. 2012 Naia Rueda Verdejo - Many found the aromas and flavors to be too subtle while others embraced this varietal as the type of white wine for which they had been looking. 2012 Juan Gil Jumilla Monastrell - A party favorite, this varietal was new to all the guests. They loved the ripe black fruit, the spiciness and the interesting bit of earthiness. 2008 Vina Pomal Rioja Reserva* - Rioja was the red wine of Spain with which guests were most familiar although not many had not tasted it. Guests enjoyed the pronounced aromas and flavors naming characteristics like cherry, berries, vanilla, cedar and incense. They were interested in learning about what Reserva means and the different oak barrel options available. A couple of the men at the party commented that it made them want grilled meat. It was wonderful to meet you and Jonathan and all your friends. I enjoyed hearing all the new wine drinkers Wine Thoughts and sharing a night of Spanish wine with you! Thanks for a great event, Sandra. Everyone had a great time and the wine was wonderful! You are very welcome, I really enjoyed it as well. Happy birthday and I hope you enjoy much good wine over the coming year! Excellent evening! Fantastic presentation and great feedback from all of our guests. Couldn't have asked for a better person to talk us through the wines. I am looking forward to doing it again anytime.